My first memories of my grandma were with my grandpa. They were always referred to as “Grandma and Grandpa” in our house, where I capitalized their titles like they were names, like Jesus. They were, looking back, the backbone of my family. My grandpa was a chess-playing, bar-b-queuing generous man who loved me. My grandma was the center of the house, wherever she was. Her name was Juana. She was born on the October 31, the eve of All Saints on the Catholic liturgical calendar. In Mexico (where she was born) it also was Día de los Muertos, or The Day of the Dead, a celebration that represents the unity between life and death, where merging of the Catholic feast with Indian rituals was commonplace. This was a picture of my grandma’s faith: Catholic to the core with a little spiritual concoction thrown in. 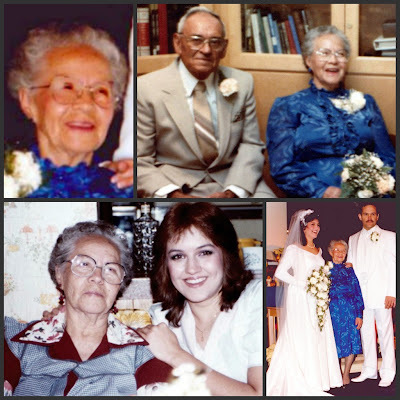 “Mija,” she once said to me when I was old enough to digest a strong spiritual truth. “Last night I dreamed that we were in a funeral, crying, crying.” She looked a little excited, delivering this news to me. “This means there will be a wedding in our family!” Sure enough, my cousin Debbie was engaged the next week and grandma pretended to be surprised. She was also a big believer in church, confession, the Rosary and honouring the spiritual superiority of Catholicism. When I told her in 1987 that I was leaving the Catholic Church to begin attending the Methodist church with Mario, she shook her head and pursed her lips. “Oh, Janet...” she half-whispered. “What have you done?” In her eyes, it was almost the same as a tattoo or a piercing, an action unbecoming of a granddaughter of hers. With all of this said, I must tell you that my grandma was the most amazing person I ever knew. She was the most loving, most personable, most teachable soul I have ever met. She was my hero from a young age, for who she was, her ability to make others happy, and her capacity to be there whenever you needed her. She stood not quite five feet tall, with black hair that hung down to the middle of her back. I didn;t know this until she spent the night at our house once, and she unrolled her braid from the crown that usually crested her head and brushed it out before she went to bed. I almost gasped in the dark, but I was supposed to be asleep. From my bottom bunk I heard her praying for a long time, then finally fall asleep. “Patty,” I whispered to my sister above me, “grandma has long hair!” Patty was asleep, but apparently my “secret” made me a laughing stock at the breakfast the next day. “What did you think it was, moron!” Patty giggled over our mush and hot chocolate. Grandma was laughing, too. She thought the whole thing was precious. Since she never learned to drive, she seemed to cook constantly, always being ready for surprise guests (who always were showing up, actually surprised that a meal was awaiting them). When we (her immediate family) came over, she would reach into her kitchen drawer, take out a ball of dough and roll a tortilla and have it in our hands before we could sit down. She made molasses cookies sprinkled with sugar that always had thesame size and shape (I still remember how they tasted) and beans that were so famous in our town that our driver’s ed. teacher actually drove us by her house just in case she’d be cooking them. In a world of changing everything, she was a constant. A beam of joy and light and joy and everything I ever wanted to be. On February 21, 1992 she died, after a short illness. My kids knew her as their great-grandmother who cooked burritos for them. I knew her as my whole world’s ozone, the one who held everything inside, the one who was the touchstone of everything. I was perplexed at how few tears I shed at her funeral, confused by the thing that others call grief. I was still in shock. It wasn’t until 1993, at the Police Olympics in San Diego when I got in touch with my grief. It was the weirdest thing in my life. Mario, competing in the decathlon, was out after ripping a hamstring muscle the first day of competition. While disappointed, he made arrangements for us to at least enjoy the trip while we were there. We decided to take the red trolley into Mexico the next day, where we would shop and eat. On the crowded train, a woman of my grandma’s stature sat directly opposite me. I looked up at her, and realized she was a small Mexican lady, with a black braid wrapped around her head like a crown. She had my grandma’s eyes, her shoes, even the style of dress my grandma wore. I looked up at her, and she smiled at me. I smiled back, then for some weird, unexplainable reason, I began to cry. She was so like my grandma, who I now remembered was absent from my life. A woman who I missed beyond measure, who left a gaping hole in my heart that was just revealed to me. 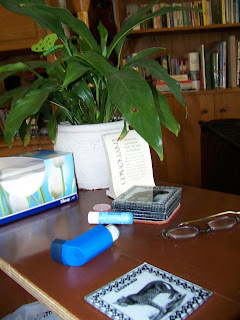 I realized that in the past year I had become very busy, taking care not to reconnect too much with her memories or her things. The tears became sobs and Mario looked at me, startled. “What’s the matter, babe?” he asked, pretty loud. People were staring already. The woman across from me opened her purse and took out a McDonald’s napkin that was folded in her purse, handing it to me. I tried to say thank you, but I couldn’t speak. She knew she had triggered something, I think, because her eyes were knowing and made deep contact with mine. Mario’s concern turned to a whisper. “Janet, what is wrong? People are starting to give me dirty looks.” It was then that he saw her. “Is it this lady? Is it grandma?” I nodded. He put his arm around me and escorted me off the train at the next stop, I assume for air. When we got off the train, it all dried up again. I was left, speechless, tearless and without any good explanation for what happened on the train. Mario didn’t need any explanation, he just held me for a bit and then we got back on the trolley. When I got home I called my mom. I told her the story about the mystery lady on the trolley, and she totally related. I made a point to actively grieve my grandmother, every time I remembered her. Last year I planted a big, pink rose in my garden called Rina Hugo that reminded me of her. 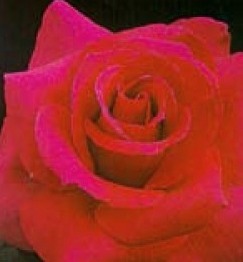 It has gorgeous, old rose delight, with big pink buds that in the Southern Hemisphere, are open on her birthday. Just like grandma – bright, fragrant, delightful. On Dia de los Muertos, the person who died and is honored is believed by some to have a spirit that is expected to return to their home. I know my grandma is home. Tonight in a beautifully aromatic evening on our back porch my husband, Mario and I played a game of cribbage. The board we bought from a local SPCA thrift store, complete with pegs and cards and directions on how to play. Turns out that the directions were probably translated from Chinese, and we couldn’t make heads or tails of it, so we had to youtube a video on “How to Play Cribbage”. We learned right away. I should say Mario learned right away. I am the one in our relationship that has a problem recognizing abstract patterns, so card games are not easy for me. When I first visited Lake Tahoe with Mario he took me to a Black Jack table (his idea of fun then) after he taught me the basics of how to play. Since I can’t add numbers quickly in my head, I usually resort to adding with my digits, which I chose to do under the table. The dealer wryly warned me to keep both of my hands on the table and not to try any tricks. I thought she meant counting tricks...turned out she meant cheating. Anyway, back to cribbage. I decided about a year ago that I would play a game with my husband that HE would enjoy. After years of Trivial Pursuit, Scene-It and Scrabble (not to mention sacrificially watching cooking shows) I realized how much he deferred to my preferences. In this realization, picking up the cribbage game made me think that I would buck up and learn his game, on his terms – his way. He walked me through our first games, then let me pick my own hands. 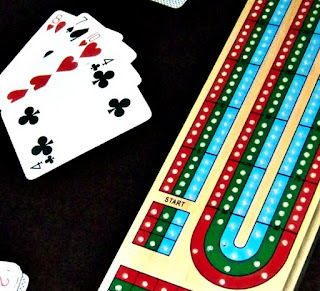 In cribbage, each player is given two pegs that they place at a starting point on the board – a wooden strip with holes numbering 120 until the finish. Each player is dealt six cards. Once the cards have been dealt, each player chooses four cards to retain, then discards the other one or two face-down to form the "crib" which will be used later by the dealer. At this point, each player's hand and the crib will contain exactly four cards. The goal of play is to take turns in creating number combinations that will get you to 31. As you play you speak aloud the value of your card, then add against the last play. If Mario laid a 9 down he would say “9” if I were to lay a 5 after that I would say “14”, etc., and we would take turns without the total going above 31. A good player gets used to recognizing basic card patterns (pairs, 15’s, runs, etc.) and the longer you play, the more you can see the best order to lay down cards- even if your hand is not so great. The first player across the finish line wins. It is a game that you can play while discussing world events, drinking wine, etc. It isn’t like Othello or Chess...it’s an old bar game. According to gamecolony.com, cribbage is one of the first classic card games. Originally called Noddy (no kidding) its origin is accredited to a man of quirky description: an Englishman named John Suckling A poet, playwright, traveller, and expert at cards and dice, he was also known as a womanizer and a notorious wit. In one of his biographies, he was described as something of a scoundrel with a gambling problem so well known that “... no shopkeeper would trust him for sixpence". In 1641, John Suckling was involved in a conspiracy to save a friend who was jailed in the Tower of London. The plan failed and Sir John had to flee England for the Continent. Unable to return to his country, Suckling ended his life a year later, at the age of 33. It’s kind of sad, those out of a life lived so “out loud” he took his own in utter despair. He left behind a game we play to distract us from thinking too hard some 400 years later. What a contradiction. Each time I play I watch Mario light up and recognize pattern after pattern while I am busy trying to add in my head. It shows how we have different strengths, different preferences. This small game was a purchase for about two American dollars and was born out of a desire to show appreciation for my husband ...and the desire to learn something new to show love for a man who does so much for me. I suspected I would not be good at it, at first, but I love it because it has become a little secret pastime for us. Even the small things that you can give to each other to show love is important. Hennie in Malawi ordaining 300 elders into ministry. Today Mario and I trekked across Johannesburg to spend a day at Cornerstone Church for a meeting we call “Africa Planning Time”. It ended up being more than a meeting to us, but rather a guttural soul-cry to something deep inside of us. God, Himself, brought us to Africa to preach the Gospel to all nations with the people who attended the meeting today with us. 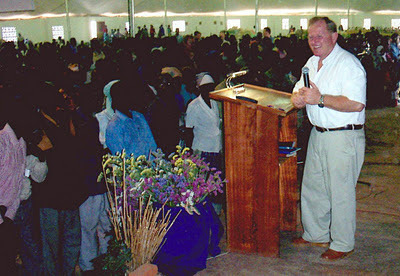 These men and women have moved countries, sold homes, have no retirement programs or IRA’s, drive dusty bakkies (pick-ups) that are equipped with flood lights to shine on a meeting in the bush (the middle of nowhere) and have families who have sacrificed them for the haunting call to go out – to spread the Gospel where few feel comfortable going. Someone has to do it: it’s these guys. In the middle of them all is a man named Hennie Keyter. I met Hennie the day I realized that the call of the Apostle was real and for today. It was 1999 and we were in L.A. at a convention for church leaders. He challenged us with an invitation: come to Africa and be changed. We didn’t even have passports. The next year, after much deliberation, we accepted the invitation. With the help of our family and friends we were able to go to Africa for the purpose of joining a team in the poorest nation not at war: Malawi. The trip was meant to help build the existing church in the rural areas, and it changed us in a way that is noticeable to the rest of the world. I remember arriving by plane, being picked up by the team, going out to the bush, arriving at a small and desperately poor village and setting up camp. That night we were scheduled to preach in the village square, and we prayed with a team of mostly South Africans from afternoon until sunset. By the time I opened my eyes, I realized we were in a place that was so far removed from any town or city, the stars were from horizon to horizon. From there, we lit kerosene lamps and began to walk to the village square. The young children who escorted our team were brimming over with joy, singing “Jesu ndi wonga, wamayo, wam bu ya ya....” (Jesus is mine, mine forever...). I followed the lights, my arms covered with goose bumps and my eyes brimming with tears. I didn’t speak a word of Chichewa, but I knew they were worshipping. It was just the beginning. The rest of the trip was one miracle after another. The Bible exploded and its truth and practical application made my belief in God explode. By the end of the trip we confided in Hennie that he had seriously messed up our lives. How could we go back to our lives and be satisfied? In us, we had a burning desire to live like this: a calling was awakened in us. His questions were well researched. He had heard promises before of others who wanted the goose bumps but not the cost. Hennie was hard to argue with. He never asked us to do what he, himself was not prepared to do. After graduating from seminary at a tender young age, he ventured out into Africa to live out his dream: preaching the Gospel. His manual was the Bible, and his wallet was faith. He soon met and married Rita, his wife and had Anton and Mari, his kids about the same age as our own. By the time we met him Hennie had worked into nearly every country in Africa and had been part of building up churches in cities, villages and places that didn’t appear on maps. He had faced firing squads, had six rounds of Malaria and was tough-as-nails, but as tender for Jesus as anyone we had ever met. So, in 1999, he seemed like a modern-day Paul (the apostle), travelling and fathering hundreds of churches that held him in high esteem. In all of my life, I had never wanted to be like anyone as much as I wanted to be like Hennie. Travelling with him carried certain demands: it was Hennie’s way or no way. We could never be tardy for anything; we could never complain or expect special treatment. We were soldiers, and the expectations were as stringent as they were understandable. We loved it. For three years we travelled in and out of Africa before we decided to move to Johannesburg. In moving, we left everything- namely, our families. Our daughter (17) came with us and turned 18 in South Africa, our new home. The costs of international travel are hard to count. There is, of course, the financial, but there are also hidden, unexpected costs that pop up like moles at the most inconvenient times. Even the most disciplined of disciples gets tired and discouraged. After miracle after miracle you would expect that you would never lose faith; you would never complain. In my quest to be the best at international travel and the apostolic calling and working in team, somehow I became wounded and we pulled back. After two years of serious travel, we told Hennie that we were resting for awhile. In “resting” from international travel, we became more active in our local church. As much as it sounds different, the work of ministry in South Africa is very much African, especially into the townships. We weren’t by any stretch wasting our time here (or idle), but it was a very different calling. In the two years that followed (until now) we were active in building a large community center that our church now meets in. We were part of a church plant into the township, built up new leaders – encouraged existing ones. Mario was asked on to the team of elders at Junction, and our lives were still constantly dependent on what God wanted for us that day, at that moment. Still, our hearts yearned, at times, for our friends in other nations: Leston and Stanley; Edwar and Mary; Boldo and Ganji; Amos and Soji... especially during times of political unrest, war and famine. So today, as we walked into the meeting as representatives of Junction Church, we quickly became excited as we saw everyone. It was like having a part of your heart woken up again. As Mario chatted with Hennie, I sat with Rita for the beginning of the meeting, talking about everything from our kids and grandkids to our gym schedules. By the time we made our way to our seats we had chatted for nearly half-hour, barely scratching the surface. “We must make a plan to get together,” she said, in her Afrikaans accent. “How about I make us dinner?” I offered. She agreed and told me she would look at her “diary” (calendar) and get back to me. The meeting began and soon gave way to friend after friend sharing about what God was doing in each country. Hennie was given a spot to share, to encourage the rest of us. As he did, tears came into my eyes, thinking of how he changed our lives by the example of his own. How he bravely dared us to get out of our comfort zone and come to a rougher, less cushy, more edgy place in our faith. I sat, stunned, as one of our greatest heroes honored us in a room filled with folks that we love working alongside of, and admire. I wasn’t embarrassed, what Hennie shared was truth. Still, it was a loving statement in a room filled with so many inspirational people... and it assured us we were still close to his heart. Mario and I looked at each other after he sat down, and smiled, kind of dumbfounded. It was incredible. As I type this tonight, I can say that our lives have had many seasons here. There was the moving season, the travelling season, the building season and then there is where we are now. Having received a permit for permanent residency less than two months ago, we are now faced with a question: what is the season God has before us now? What are the possibilities? That’s the God we serve. My friend, Jaclyn is here from the USA, visiting us and hopping into our lives here. Although busy, we are forced to take time off and smell the roses as we show her around. Yesterday we took her to a local favorite: The Lion Park, a secured private farm with three prides of lion and assorted game. She loved it!! I thought of you, friends, although my pictures are just snapshots, I think you'd enjoy seeing some close ups of what's in protected areas here. I hope you enjoy!! A cub eyes us as we pass by. All animals are fed daily by a staff that are rigid conservationalists, the park is one that charges admission and provides game drives or self-tours (with approved vehicles). It is a good option if you can't get to a national park, or if there is not one close by. Many people do university lab work here, and we actually met one from New Jersey when we went. One of the first things you learn about being a foreigner on foreign soil is to identify yourself by the nation you come from. We have grown up citing our heritage (I’m half-Irish and half-Mexican) rather than our country because America is called the melting pot – full of Americans who are (as Schoolhouse Rock says) “something else as well”. We have learned to say we are from the US, primarily because our fuax pas of saying we were American happened in Brazil, where a highly educated Brazilian said, at the table we were eating, “So are we!” The table erupted in laughter, and I sensed a feeling of being told off, by people who were used to the narcissism of visitors from the USA. South Americans are Americans, too, he insinuated, loud and clear. In school we were taught that “Columbus discovered America” and we memorized the poem “In 1492 Columbus sailed the Ocean, blue”. We were taught that if it weren’t for Columbus we wouldn’t be here. Somewhere after Columbus came the Pilgrims and Thanksgiving, then Lewis and Clark. All of these were before recess and sometimes my mind wandered. All I needed was a teacher to spice things up – maybe by telling us all the real truth. First in to the North Amrican spaces were (by most theorists) the ice-trekking Asians who later became known as “Native Americans”. Second was Leif Erikson, who plunked down on Newfoundland and third was a misguided, clueless...and brave leader named Cristoforo Colombo, hailing from Italy. Colombo (we call him Columbus) started sailing as a young child (some say as young as 10) and later learned to navigate by stars, the greatest danger known to man: the Ocean Sea. He was part of trips to the Indies, where spices, tea and (shhhh) opiates were collected and brought back to the European monarchies, who shared the wealth with the upper class of their nations: those who paid. This “spice route” was powered by the greatest ally of any sailor: the trade winds. These helped the relatively small ships negotiate the powerful ocean, waiting to push them into oblivion – literally over the edge, as many believed. It is the “earth is flat” belief that kept Columbus from obtaining funds for his own Captaincy to the Indies. 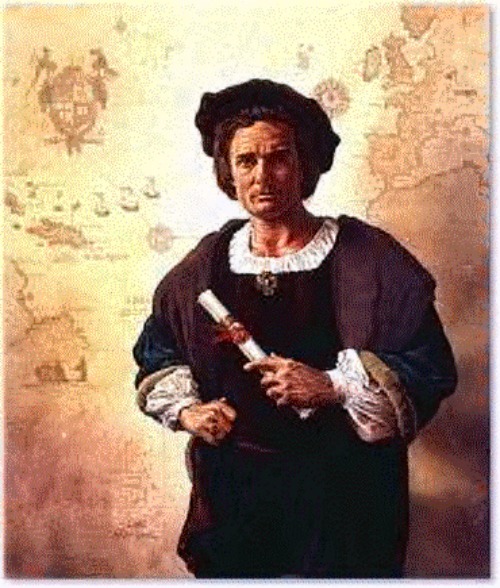 Although Christoforo (now 41 years old) had a theory that he could get to Asia faster and use different winds, the theory was unpopular and became a taboo subject in Portugal and Italy. It is still unclear to most historians how Columbus got the knowledge of faster winds (he didn’t write about it in his journals), but he eventually convinced the Spanish monarchy to fund his trip—pay for his crew, his ships, and the food and water they would need- to Asia, not the “new world”. Columbus, in all estimation, never hypothesized that there was land between Europe and the Asia. Like many great discoveries, it was an accident. What Columbus “discovered” on his first trip (he set sail on On the evening of 3 August 1492) with his three ships: the Santa María (nicknamed Gallega), Pinta (the Painted) and Santa Clara, (nicknamed Niña after her owner Juan Niño) was modern day San Salvador, or the Bahamas. On the morning of October 12, 1492, a lookout from the Nina spotted land, or light, from the shore. This sighting was hotly disputed between the crew and its captain: Columbus claimed for years after that he had seen the light hours earlier. Typical man. The indigenous people he met there were peaceful and friendly, and a little surprised to have visitors. Colombus saw them as a vulnerable people, but realized that they would have to become slaves...and be baptized. Between 1492 and 1503, Columbus completed four round-trip voyages between Spain and the Americas, funded all by Ferdinand and Isabella. Because of this, the Americas spoke primarily Spanish and had Spanish names to identify them. It began the inevitable: the European exploration and colonization of the American continents. With progress (the discovery of the “new world”) always comes the bad (the enslavement and genocide of its native peoples). It is the inevitable mark of the conquerors and the conquered. Though not popular now to speak this out loud, Columbus did the inevitable: he ran into the Americas. Someone was going to do it, and it might as well be him. Since the leaders in the field of exploration that day (the Italians and Portuguese) also served a Catholic monarchy, the fate of the Americas would most likely have been the same. In my estimation, the day is worth celebrating, even though we celebrate the joy of discovery as well as the darkness of conquering kingdoms. · He believed (and taught his crew) that Japan and other inhabited islands lay far to the east of the coast of China. · He refused to “claim the land” of San Salvador for Spain – thinking that they were part of Asia. This may explain why, in part, why the American continent was named after the Florentine explorer Amerigo Vespucci and not after himself (We are America, not Columbia). · His pride kept him from achieving closeness with his crew, as Lewis and Clark did with the Corps of Discovery. · In the face of mounting opinions to the contrary, Columbus believed Aristotle’s theory of a spherical earth, and boldly took on the Church to explain his route and his confidence in it. · He brought back chocolate, tomatoes, corn cassava and tobacco. Many countries in the Americas celebrate the anniversary of Christopher Columbus's arrival in the Americas, which occurred on October 12, 1492, as an official holiday. Once, in my classroom, we illustrated the holiday by taking a picture of Columbus, outlining it with glue and sprinkling powdered spices on it. Two of the kids had to go home because they got the stuff in their eyes and their parents didn’t speak to me for about a week. Like Columbus, I’m an example of having a good idea, but not exactly having it work out the way I saw it going. Today I was at the gym on an elliptical machine, sweating my tuchus off when I saw the headline on CNN: “Three women have been jointly awarded the 2011 Nobel Peace Prize for their non-violent struggles for women's rights”. 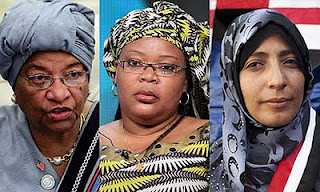 I saw it unfold through my foggy view: Liberian President Ellen Johnson-Sirleaf, Liberian activist Leymah Gbowee , and Tawakul Karman, a Yemeni rights activist. I looked back at Mario, sweating on his Stairmaster and pointed to the screen. “Two African ladies!! Two from Liberia! !” (I said all of this with my eyes and hand gestures). Mario looked past the screen at the weight section, looking for a friend or a fire. I gave up trying to communicate and watched the screen again. While Tawakul Karman is separated from Africa by a small sea once parted by Moses, I had only heard her name for the first time today. The other two ladies are connected, like sisters. They come from a small, poor, West African country, Liberia, whose national food (if you ask any West African) is rice. Their stories and their mission is intertwined in a way that is both charming and miraculous...and now recognized in Oslo as distinctive in a move toward world peace. To appreciate the women, you may first want know how the civil war in Liberia began. Originally colonized (unofficially) by the USA in the early 1800’s, Liberia was populated by freed Black slaves (sent there from America) and native Liberians. The descendants of American slaves became known as Amero-Liberians (or Americo-Liberians), while the native people were known only as Liberians. The former slaves soon became like their former masters: a ruling elite that enslaved the native people. Resentment grew over the years towards this “ruling portion” and in 1980 a coup d’etat led by Samuel Doe, an indigenous Liberian, ousted the former regime of Amero-Liberians which had ruled Liberia for more than 150 years and installed his own. By most accounts, the newfound leader, Doe, abused his power, and in king-like fashion, the tables were turned: slaves and masters now on opposite ends. In 1989, a group called the National Patriotic Front of Liberia (NPFL) crossed over the Liberian border from Côte d’Ivoire (sworn “brothers” to Liberia) to overthrow Doe’s regime. The NPFL was made up largely of the ethnic groups who had fled Doe’s abusive hand, as well as some mercenaries. This launched the beginning of a 7-year civil war (1989-1996) in Liberia. Much of this war was fought over control of areas that have precious resources, such as diamonds, gold, timber, rubber and iron ore.
Charles Taylor, the leader of the NPFL controlled most of Liberia by 1992, and in 1997 he won a dubious election, becoming Liberia’s President. For those paying attention, that’s three overthrows in 12 years. All of this was for control of resources, power and people. All done by Africans...to Africans. Taylor’s reign was marked by war: he employed anyone who would enlist and kidnapped teens from their homes and “accepted their application” for the army. Rebel groups emerged: the most prominent among these: Liberians United for Reconciliation and Democracy (LURD) and the Movement for Democracy in Liberia (MODEL). Because of his coup, he vowed no one would gain power from him, and he fought desperately and hard: controlling the public media and supporting the civil war in Sierra Leone, mainly to gain thugs and mercenaries from their camp, as well. (In June 2003, Taylor was indicted for war crimes in the 10-year civil war in Sierra Leone). It seemed the wars in West Africa would never end: and the countries that “hosted them” were the real losers. 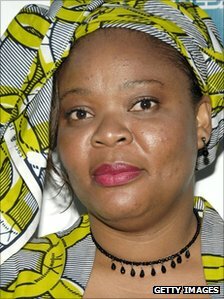 Enter Leymah Gbowee: a trained trauma counselor during the civil war in Liberia working with the ex-child soldiers of Charles Taylor's army. In dealing with the physical side effects of war, compounded by the emotionally crippling aftershocks, she realized that "if any changes were to be made in society it had to be by the mothers”. She took on a personal mission to mobilize and organize women across ethnic and religious dividing lines to bring an end to the long war in Liberia, and to ensure women's participation in elections. In 2002, as a mere social worker, she organized the Women of Liberia Mass Action for Peace to pray and sing at local open air fish markets, the center of the Liberian communities. In doing this, she united both Christian and Muslim women of Monrovia (Liberia’s capital) to pray for peace and to hold nonviolence protests. One of the most vocal and noticed “protests” was a recurring prayer meeting on a football field on the edge of Monrovia, where local women, dressed in white T-shirts, would sign and pray in the hot sun and through heavy rain. The words on most signs held by the women: “We want peace now!” was written in English, French and the native Gio. Finally, in 2003, with the world watching, Liberia washed its hands of Taylor, Civil War and the sexist elections where women couldn’t vote. After the war Gbowee organized the same crew of Christian and Muslim activists in nine of Liberia's 15 provinces to help Ellen Johnson-Sirleaf's successful campaign for the presidency in 2005. 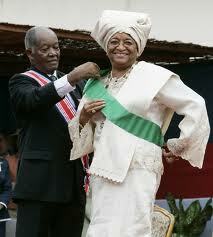 Sirleaf, a democratic hopeful who would become Africa’s first elected femal leader. Ellen Johnson, a native Monrovian, is one of the descendents of the Americo-Liberians, although she has been quoted as rejecting her class and ethnicity, saying "If such a class existed, it has been obliterated over the last few years from intermarriages and social integration." Through most of Doe’s regime (while Gbowee was organizing the masses) she was imprisoned for openly criticising his ruthless power-hungry cabinet and their reckless abandon in the country. Upon release, she first supported Charles Taylor's rebellion before realizing he was just as bad. After Taylor gained power, he imprisoned her for treason. Her controversial 2005 election run-off (against former football star George Weah) was contested by her opponent. She weathered every accusation when she took office, crediting Leymah Gbowee as instrumental in her taking office. Following her election in 2005, Sirleaf pledged to promote national reconciliation by bringing in opposition leaders into her administration, which she has. Although the prospects of the country seem limited, they are on their way to a new life as an independent country with PEACE. Because of background as a development economist, Mrs. Sirleaf is held in high esteem by most Liberians, who ache for the country to get on solid ground and rebuild Liberia's shattered economy. Yesterday I was having coffee on our leather sofa in the big lounge we call the living room. As I put my cup down on our coaster, I noticed the one on the bottom of the stack...and smiled. It is (like so many treasured things in my life) an odd thing. Our coasters are a matching set of glass squares that have artistic impressions of Africa’s Big Five on them. All except one, a cork-backed one of Munich, or Munchen, as it says on the front. 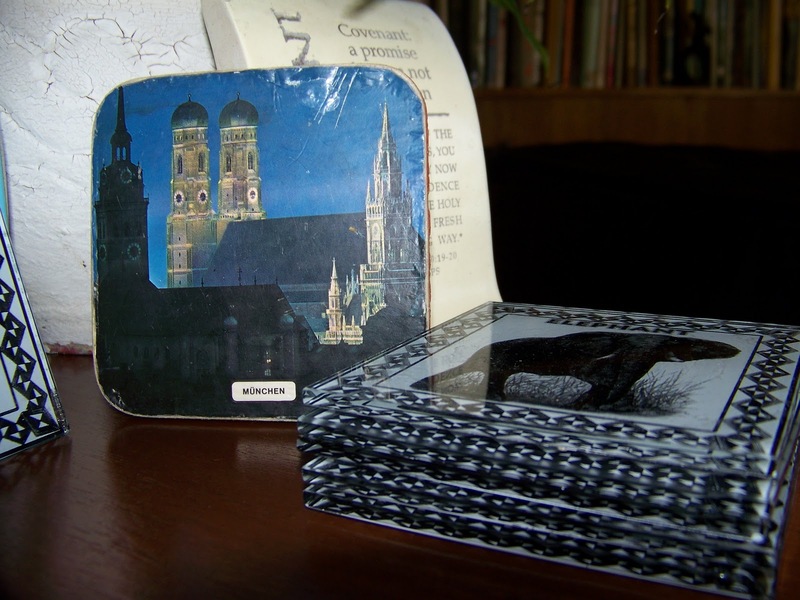 The one cork-backed coaster is the last of a set we have had for twenty years, a gift from my Aunt Emmy, after a trip she made to Munich. We used them in our former living rooms, usually at Family night where we played Tripoli at the dining room table with the kids (and occasionally my brother-in-law’s family). The coasters would stick to the bottom of our glasses, wet with condensation from iced Diet Cokes or Orange Juice. They even stuck to the winter beverages, like the hot chocolate that Vince and Alicia loved, or my Rooibos tea, once we discovered it. We used the sentimental coasters until they were tattered at the edges and had the paper coming up from the cork. I super-glued them when it was time to move, and they came with us to South Africa. Here, they took their place in the living room with the entire African decor (“Your room kind of looks like a game lodge,” people would say) and became the sticky bottoms to our Southern Hemispheric cold drinks. A few weeks ago, at a table fair at the Northgate Mall, Mario discovered the “new” coasters, a set of clear glass ones with gummed feet: proper, beautiful replacements to the tattered ones we had for years. I loved them immediately. I even loved the way they looked as a stack: green sides in a geometrically perfect pattern against the potted plant on the table between the two couches. I was glad to throw away the old Munich ones, even though they had such sentimental value. It wasn’t until Lorraine, the lady who helps us clean the house, found a lone coaster in my room under a glass of ice water from the night before. I looked at it, and suddenly was emotionally attached to it. I know it sounds weird, but it reminded me of all of those nights of Tripoli and “Touched by an Angel” that marked our family nights... and I remembered the sacred-ness of them even when the kids were teenagers...making time for each other and calling our drinks “cocktails”. It also reminded me of my Auntie Emmy who always gave us perfect gifts, ones that were so valued by our family. Our punch bowl, my beautiful rose vase...these coasters. I couldn’t believe I threw the whole set away just because they were old and worn out. I hid it under the geometric stack of the African glass ones, vowing to have it be buried with me (or cremated with me, at least). The coaster is a strange example of how “certain somethings” can make me tear up with joy and reminiscence and love and sadness all at once. I guess that’s why I can be called sentimental. It’s never really big things, like couches or tables or jewelry—it’s always something like a coaster. I can imagine the reaction to this...a small post about a coaster that has more attached to it than I ever thought would be. Today, October 1, 2011 is a very special day. We have just returned from a wedding held on the expansive property we call "Plot 1" where our friend, Petros, has a pre-school. Today it was the host for a very cool wedding: the wedding of our South African "son" to his beloved girlfriend, Yvonne. In my haste to make their wedding perfect I forgot my camera, and I have no pictures to post of the event!! Mario was on and gorgeous as the minister who performed the ceremony, and I can only say that all I did for him was pick out his tie... He was amazing. The bride (Yvonne) was a blushing bride with her parents by her side until she was handed off to Chris, where the shouting and applause was deafening. The whole day was so perfect: a result of some very careful planning. Finely rehearsed dancing (the wedding party knew four or five steps to enter, exit, re-enter and dance for the reception), some very cool volunteering (the cakes, flowers, venue, cooking) in making the day special, and some great family traditions that I admit (as a white, time-driven wedding coordinator) had to be explained. Today, I am pleased to look upon this couple who prepared for marriage as much as they prepared for their wedding, and smile. It is good to be a part of the whole thing. But...I am exhausted. So my post is short tonight. On a different note... my blog appearance has changed. In the efforts to please its bloggers in a vast "www-ocean" of blogging options, my blog's host has given us all some very "new" designs for our blog's look. How do you like it? ?